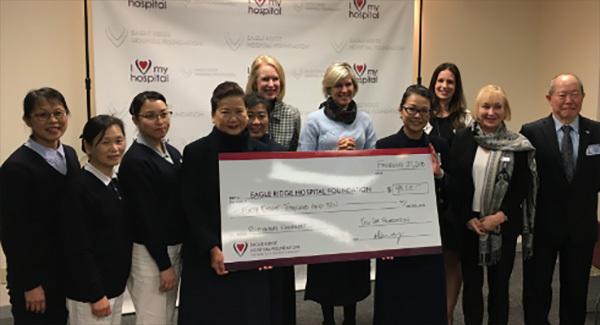 The Buddhist Compassion Relief Tzu Chi Foundation Canada raised $48,010 towards the acquisition of vital respiratory equipment (a Bi-Pap Ventilator, 3 AIRVO’s and a NeoPuff) benefiting patients with breathing challenges at Eagle Ridge Hospital. Attending this special cheque presentation ceremony include Anita Wong, District Director and Tzu Chi Foundation representatives from the Tri-Cities, Maple Ridge and Vancouver. Representing Eagle Ridge Hospital Foundation include Alison Johansen, Board Chair and Cheryl Bosley, Director, Fund Development. Representing Eagle Ridge Hospital include Linda Leveridge, Director, Clinical Operations and Alea Bever, Manager, Clinical Operations, Monitored Care Unit.